Minnow approves :-) | carpe diem! 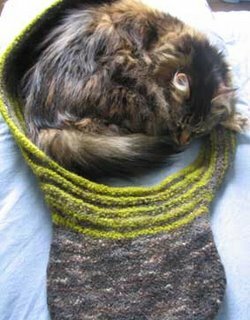 Bordi’s book includes patterns for moebius cat beds, and I did buy some wool (the purple) knowing I’d have to make at least one. Sooner than I’d planned, by the look of it! This entry was posted in Uncategorized on May 16, 2006 by sarahw. That picture shows the bag really well. I love it! And Minnow is adorable. Your lucky Minnow is just sleeping next to it and not attacking it like my cat used to do!